Birth Date/Place: September 11, 1972/Media, Pa.
Simons was a member of the 1996 Olympic Team that placed fifth. This was the strongest men's team since 1984. Simons has announced his retirement from competitive gymnastics and will move to Ann Arbor, Mich., August 1997, to work as the Assistant Gymnastics Coach for the University of Michigan. 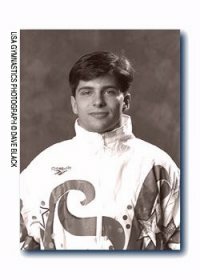 He is a two-time World Championships team member and earned a spot on his first World Championships Team in 1994 by finishing seventh at the 1994 National Championships. He was a member of the gold-medal Pan American Games team in 1995. Although his name, Kip, is a gymnastics skill, he is really named after Kip Keino from Africa who earned a gold medal in athletics at the 1972 Olympics.